1 Then Jonah prayed to the Lord his God from the belly of the fish, 2 saying, "I called out to the Lord, out of my distress, and he answered me; out of the belly of Sheol I cried, and you heard my voice. 3 For you cast me into the deep, into the heart of the seas, and the flood surrounded me; all your waves and your billows passed over me. 4 Then I said, 'I am driven away from your sight; yet I shall again look upon your holy temple.' 5 The waters closed in over me to take my life; the deep surrounded me; weeds were wrapped about my head 6 at the roots of the mountains. I went down to the land whose bars closed upon me forever; yet you brought up my life from the pit, O Lord my God. 7 When my life was fainting away, I remembered the Lord, and my prayer came to you, into your holy temple. 8 Those who pay regard to vain idols forsake their hope of steadfast love. 9 But I with the voice of thanksgiving will sacrifice to you; what I have vowed I will pay. Salvation belongs to the Lord!" 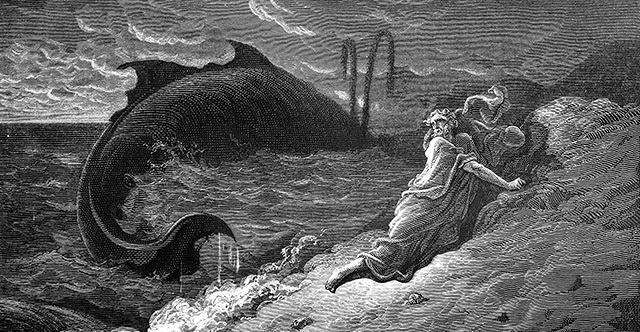 10 And the Lord spoke to the fish, and it vomited Jonah out upon the dry land.